I love this time of year! Here in Alaska we can't really start planting until after Memorial Day, but this year summer seems to be here early. So I've been visiting the local greenhouses, planning my yard, and just enjoying being out in the sun. After the long dark winter, the long sunny days just make me want to find any excuse to be outside. My camera becomes my constant companion and I store up all the beauty as inspiration for my art quilts. I thought I'd share some of my favorite shots from last year with you for this sunny Friday! The daisies are from a packet of wild flowers we sprinkled on one side of our yard. It's always fun to see what comes up and the number of flowers is amazing. The Gazania was a new plant for me last year. It's an annual but it put on such a show. I got this beauty from our local Matsu Master Gardeners' Plant Sale. Love the annual Plant Sale. I always find great plants there. 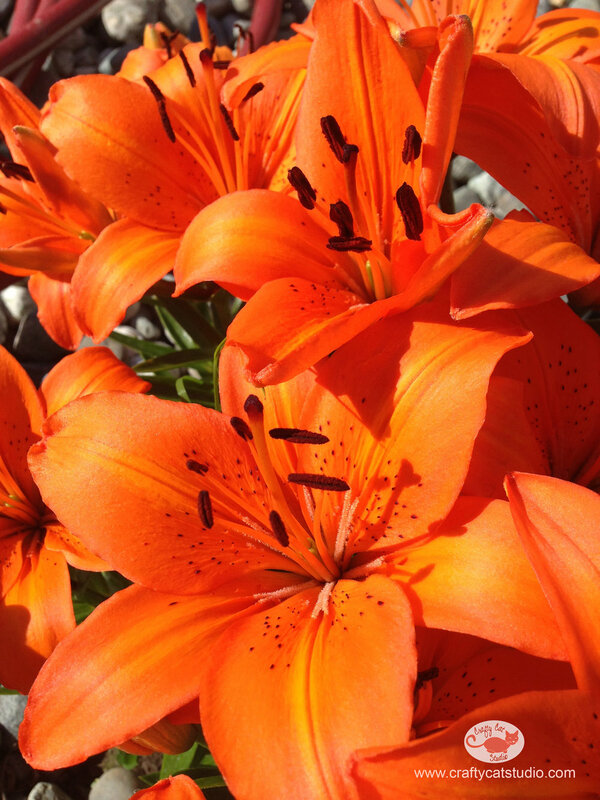 My orange lilies come up every year and are always so bright and pretty. They don't have a strong smell but they make up for it in color. My pansies are cross breeding and getting more intricate with each passing year. Can't wait to see what comes up this year. The small purple flowers are alyssum. Love how delicate these flowers are and great for keeping the bugs away. My black eyed susans come up every year and get to about 4' tall! Love how the light hits the flowers in the early morning. And last, never forget to care for your potted cats! Wesley loves to sleep in my angel wing begonia in the studio. I figure at least he's sitting still and the plant doesn't seem to mind. What's the summer colors like in your area? I can't wait to see what comes up in my garden this year!